Oh, well, then. And she hastily retreated. I got quite a laugh out of the ego check, while wishing I’d caught whose book it was she’d wanted me to be the author of so I could go tell them they had a fan. And if you read this, whoever you are out there, thank you; I quite enjoyed that, I hope you don’t mind my mentioning it. 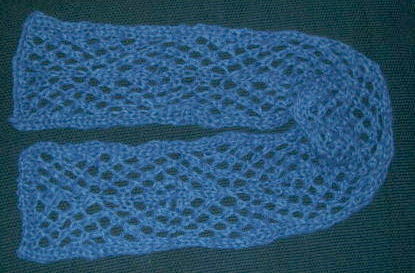 Meantime, many here know that I’ve been on a quest to knit a lace scarf for every woman at my church–my “ward,” ie, congregation in Mormon-speak. I’ll never finish, because I live in an area where university students are always moving in and out, and that’s just fine with me. But one old-time regular didn’t have hers yet. I wasn’t sure quite what to do there. She wouldn’t know about all these scarves popping up all over the place unless someone said something, and I didn’t know if… B is blind. Scarves, in our climate, are purely for decoration, and how useful is that if you can’t see it? Could it be a potential hazard, even; dunno. But I finally went out and bought some brushed baby alpaca yarn from Plymouth, figuring well, the softer the better, definitely, and something useful and warm would be the only way to go, for cooler mornings when she’s walking her guide dog. I could just picture her fingers deciphering the diamonds in the pattern, and wondered if it might convey something Braille-ish to her; I had no idea. The needles were huge–13s–and the thing made my hands ache. It drove me nuts that it took me three weeks to finish the thing. Pick it up, do a few rows, bag it and go do something else more comfortable. Gradually it got there, though. Part of the delay I’m sure was that she had a chronic cough after a bad bout of pneumonia, and I with my severe immune problems had no desire to get too close to that. But today I finally had it fingertip length and ready to go, so I sat down by her for a moment and explained about going out and shopping for the softest yarn I could find for her. About noticing what colors she wore most often to church, and going out and matching them. I pulled it out of my purse, and her German Shepherd was instantly on his feet and all nose, right there–he’d never met an animal like that, show him more! B, however, as soon as she found out I was talking about a scarf, shook her head, saying, emphatically, “I don’t wear scarves.” End of subject. Class dismissed. And you know? That’s perfectly fine. But the offer, at least, had needed to be made. Her dog, however, was, I’m sure, quite disappointed. I wouldn’t know if I should be insulted or not… But at least you don’t have to spend your time knitting for someone that won’t wear your scarf! I once mentioned the idea of knitting something intricate and lacey for my mom and got the same response. No scarves, no shawls, and most emphatically, NO wool of any kind. I was hurt. I had thought that even if she wouldn’t use it much, she might want to have something special that I had made for her with my own two hands. Something unique that had taken time and talent and had been done with her in mind. In the church members’ defence though, maybe she thought you were trying to SELL it to her? So much of a conversation is subtle and shows in body language and facial expression and a blind person might miss the intent. My mom is not blind, but she can be ‘blind’, if you know what I mean. I wasn’t insulted, don’t worry; it was an honest response. I’d figured a scarf when you’re blind was possibly a dicey proposition. What matters is that now she knows I went to that effort for her, that I was thinking of her, and that alone made the work worth it. It will definitely go to the right person at the right time. And Rho, you’re right: I’ve had it happen before that something was perfect for someone I hadn’t even met at the time I made it. It’s all part of the serendipity of knitting. Marlene, your comment came in while I was writing mine, so I’ll add a thank you–it hadn’t occurred to me that she might have thought that. Huh. You could be right. I’m sorry about your mom’s response, though–ouch! I have a friend who used his own house as a model home to sell pre-fabricated houses. Dave told me that someone showed up one day, took one look at the house, said it wasn’t what she had in mind and left. He liked her honesty. He knew just where he stood. I’m so glad your scarf won’t be languishing in a drawer somewhere, unworn. Instead it will go to someone who will really appreciate it. Every scarf deserves that. Now that I’ve had time to think a little, I realize that having her dog acting like a puppy rather than a guide dog was a real good reason on her part not to want it.